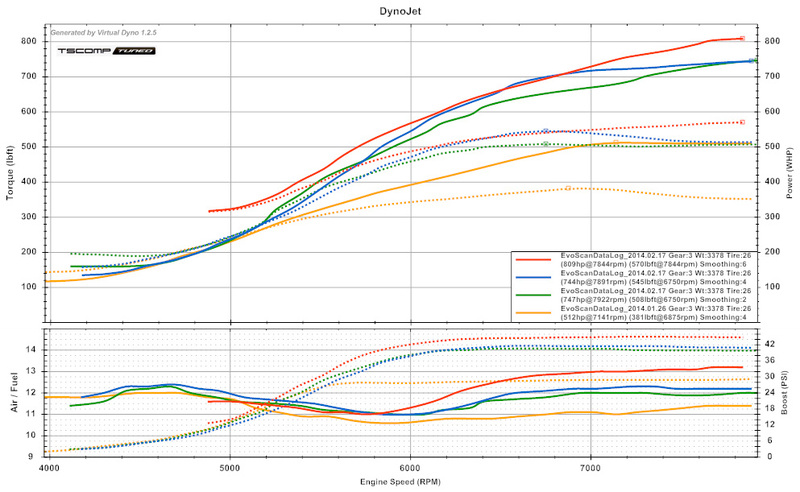 Here are the E85 results at various boost levels during around 2-3PM in California. Temps were around 70F. Unfortunately this car ran out of injectors. 100% IDC and the AFR shot to 13's so we had to stop. We also maxed out the 4 bar map sensor at 44.9619 <-- That's what it shows when you pass 45psi with the 4bar (Not maxed at peak rpm though). So we just left it at around the 740whp range for now until he switches to bigger injectors and address the fueling and map sensor if he wants to run more then 45psi. Here's the pull we ran 45psi and instantly ran out fuel and IDC shot to 100%. 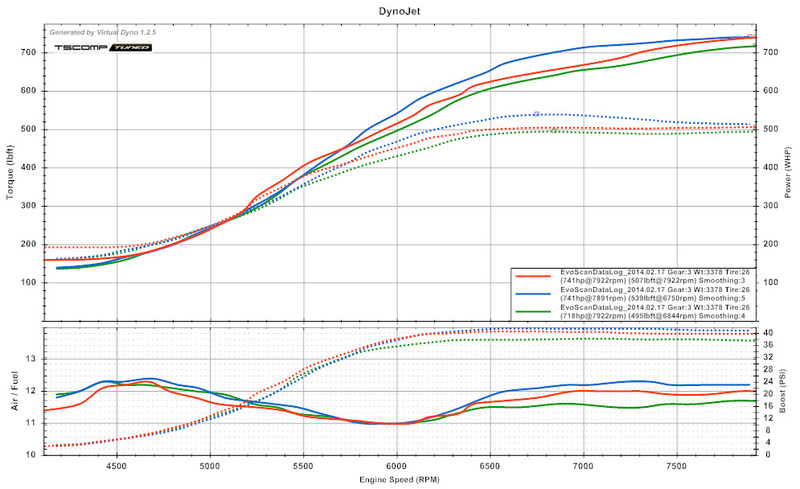 I didnt log with 2byte RPM, so 1byte only logged up to 7968RPM, so possibly it was making more power then the vd said. I ran another degree past 8k also. 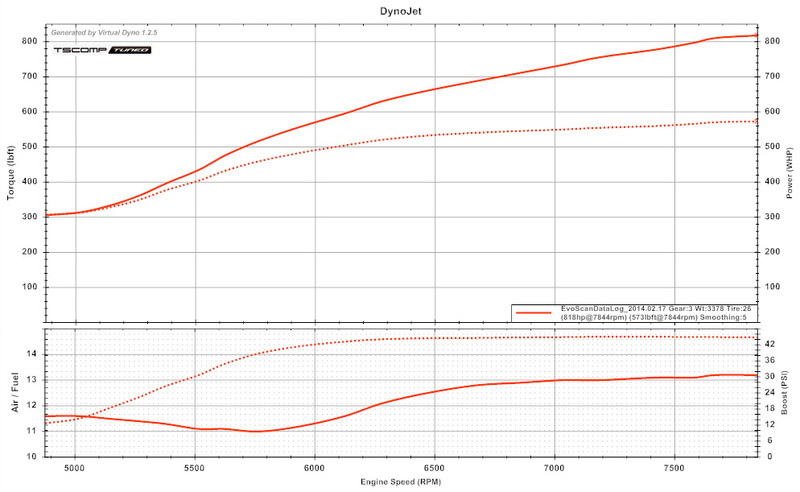 at smoothing 6 the above graph was 809whp / 570wtq. that's probably more so around 790ish, due to the 20F cooler temps and 4psi increase assuming the vehicle makes around 10whp per psi and the temps accommodate for roughly a 10whp increase. There are restrictions in the setup that could be addressed and it would make better power per boost (bigger tb, bigger exhaust, etc), but for the mods its not to bad. Heres a log showing IDC & boost on that one. Last edited by tscompusa; Feb 17, 2014 at 11:16 PM. super nice! can't wait till my 6466 is on! Last edited by tscompusa; Feb 17, 2014 at 10:33 PM. looks like time for bigger injectors. Nice numbers Tom. Makes me really wanna know where ill be sitting. That thing is a "BEAST"! Nice work Tom. what clutch is in the car? ran out fuel and IDC shot to 100%. Definitely a BEAST for daily best part I like about it. It drives like a stock car. if not, probably better. Tom, really knows his stuff. Not bad for a conservative tune until I swap out few things. Thanks again, tom. Are you staying with the same Turbo? You should see what more fuel nets you then switch to front facing and see if it gains anything. I doubt it will make much difference. Yes, staying with the same turbo. I'm still thinking twice about ff tho cus I do stay in Cali after all lol I would hate to get a state ref! Ff for daily will cause crazy attention. The roll cage does the same right now hahah.